Tami Simon: Today my guest on “Insights at the Edge” is Jai Uttal. Jai is a Grammy-nominated musician who is best known as a world-renowned kirtan artist, kirtan being ecstatic chant in a call-and-response format. His music is an eclectic mix of contemporary and ancient musical elements from various cultures throughout the Eastern and Western worlds. Jai has created five albums with Sounds True, including Kirtan! and his latest release, Bhakti Bazaar. In this episode, Jai and I spoke about chanting as a devotional practice, the story of Jai’s first trip to India, his experience meeting his guru, and his understanding of the many Hindu god and goddess figures. We also listened to three selections from his albums Music for Yoga and Other Joys, Kirtan!, and the new release, Bhakti Bazaar. Here’s my conversation with Jai Uttal. Jai, we’re going to talk today about kirtan, or ecstatic chant. And you know, I’ve been interviewing so many different people about different forms of spiritual practice—writing as spiritual practice, walking as spiritual practice—and it seems to me that chanting as spiritual practice might be the most fun form of all. And I’m curious: just to begin with, here you are, Mr. Ecstatic Chant Man—how much fun is it? Jai Uttal: [Laughs.] Well, that’s a funny question, Tami! It’s pretty much fun, but I must say that the thing about kirtan, about chanting, that continuously amazes and surprises me is the opening of the emotional channel that occurs when we’re singing. So I can be singing—and it’s more intensified with a group—but even if I’m at home singing, there can be moments when I feel incredibly sad and incredibly despairing. And I think, “Where does that come from?” And I keep singing, and then suddenly for some reason I’m feeling this terrible anger, but at whom? At what? I don’t know. I keep singing. And somehow it all seems to morph finally into this very beautiful feeling of wholeness and connectedness, and thus joyfulness. So it’s fun, but it’s fun that takes you through a journey every single time to a place of, I think, real depth. And when we’re in that place of depth, we usually do feel joy. TS: Now that’s interesting. I wouldn’t imagine that in the process of chanting, something like anger would surface. But it sounds like you’re going into a feeling-space, and that all kinds of feelings come up. Is that right? JU: Yes, exactly. Like all meditative practices, chanting takes us inside, and it takes us inside the places that we don’t normally access in our day-to-day life. So we journey inside of ourselves, and whatever’s there is there. I really encourage people, invite people, to let the process of kirtan, of chanting, work on each one of us rather than try to direct it with our own mind and consciousness, [but to instead] let our mind and our consciousness kind of follow. Because a lot of people come to a devotional experience and they think, “Well, devotional means it’s got to be good, sweet, spiritual, mild.” All that stuff. And for some it might be, but for others—you know, like myself: I have so many different feelings in me that surprise me when they manifest. But when they come out in a kirtan, every single color of emotion is another kind of rope to connect to Spirit, to connect to God. It’s amazing. TS: Now, you speak of it as a devotional practice. To whom or to what are you devoted while you’re chanting? JU: Well, I must say that when we get into a word like “devotion,” it invites a little bit of definition. Because kirtan, or chanting, is part of the tradition that is known as bhakti yoga. And bhakti yoga translates as the “yoga of devotion.” But in the Judeo-Christian world, the idea of devotion is quite different than in the ancient, ancient Vedic world from India. Here in the West, we have a somewhat narrow concept of devotion. In India, devotion really means that every bit of the human heart, every corner and corridor, every color of the human heart, every color of feeling, every flavor of emotion, is directed toward Spirit and is used as a connection—as a personal, personal, personal, personal connection to Spirit. Now what I’m saying—you ask, “Who or what am I devoted to?” On some levels it’s always changing, but on the deeper level, I’d say it’s simply to God, who exists in my heart and exists in every molecule and every bit of creation, and takes form as my guru and takes form as my child and takes form as Krishna, as Radha, as Rama, as Hanuman. But it’s always that light, that pulsating being who’s closer to me than closeness. It’s to that [that] I am just trying to connect and communicate and be as close to and be a— I mean, you know, it’s kind of funny: trying to be close to that which is closer than close. Well, then we get into language and cognitive problems! But it’s the Source that we all have. 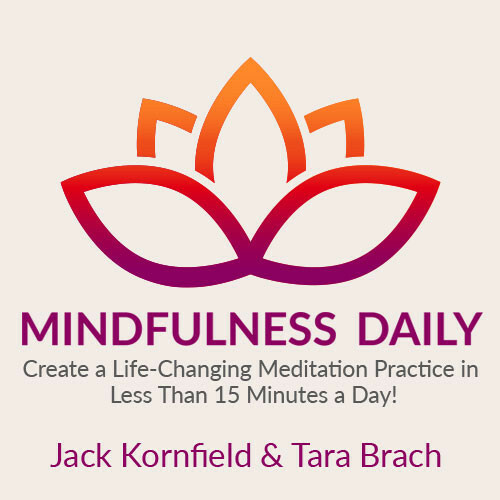 TS: Now, Jai, I’m curious: when you’re chanting and you notice a feeling coming up inside you that is perhaps difficult—maybe it’s a feeling of sadness or loss or something like that—how do you work with it in a devotional way? You said, “Don’t direct the chant.” So what do you do when that feeling emerges? JU: I just sing. I try as much as I can to invest my melody, my mantra, my words, my rhythms, with whatever emotion I’m feeling. You know, it’s subtle: how do we translate feelings into music? Every musician, that’s part of the journey of what we do, and it can’t always be expressed perfectly in words. But I sing from my feelings, I sing from my heart. When the experience is sadness, I don’t know how I learn to do this or how I continue to learn to do this, but that sadness just inhabits my melody. And my melody and my voice sing it and express it with the ebbs and flows of music. You know, all my studies of Indian music with Ali Akbar Khan, who is—who was, I should say—one of the greatest masters of Indian music. He died about a year and a half ago, and for 40 years on and off, I studied with him. And every class, every lesson that he would give, could be boiled down to the art—and I say, the spiritual art—of translating feelings into notes and into melodic phrases. And how do we do that? And it’s like an ancient, ancient yogic science of music. And as Ali Akbar Khan would always say, “You don’t learn this in one lifetime. You learn this in many, many lifetimes.” So I’m still learning it. But I don’t know if that answers your question, because it’s a question that is not easily answered. I just feel it, and I sing. And it’s like it goes into the ether. Kirtan is usually call-and-response, so there’s this constant—I sing, and the audience sings. I sing, the audience sings. I sing, the audience sings. So it’s this constant back-and-forth, in-breath, out-breath, yin-and-yang thing that happens. So I sing, and then the audience answers, and then I sing. And each repetition is strange, but each repetition can sometimes be a totally different experience. And how do I do it? I don’t know. I just do it. TS: Your answer is beautiful. A further question that I’m curious about is, what is the role of the body for you when you’re singing, in terms of contacting the texture of the emotion? JU: That’s a great question, because a lot of people approach singing and kirtan and bhakti yoga as a very kind of out-of-the-body, astral, blissful experience. And that’s so totally not my experience. While I’m singing, I’m almost always very, very aware of my body. For me, it’s a very physical practice. I’m breathing in, I’m feeling the breath, I’m feeling the energies or lack of energies inside of myself. And I’m singing, and I’m very conscious of how my body is producing the notes. I’m not practicing a body-awareness, like for example in vipassana meditation or something like that; I’m not really deeply observing and evaluating the experience of my body and how that might affect the shades of emotion. But I am just sitting in my body and feeling my body and feeling the weight of my body and singing from there, and I guess that’s as far as I’ll go with that. But when they ask me about this stuff, I encourage people to not seek an out-of-the-body experience while they’re singing. Because occasionally that happens to me, but it happens to me really when I’m exhausted or my energy is all weird from traveling or something. Then I will kind of go out of my body into that weird place. I call it weird; others might call it blissful. For me, it’s not very great. I like to be grounded, and to me then the experience is much more rich. TS: I’d love to start moving into the music itself, and I want to play a track from Music for Yoga and Other Joys. This is a song entitled “Gopala.” And it would be helpful if you could introduce it for us and tell us a little bit about this “Gopala”: who or what is that? JU: Gopala is Lord Krishna as a baby or as a young boy. Gopala is the name of Krishna before he entered puberty and adulthood. Krishna is the lord of all creation. Now, I say that not—he’s not exclusively the lord of all creation. So is Allah, so are so many. But he is one of the faces of the lord of creation; he’s the highest of all. And as a little baby and as a little boy, there are so many amazing, amazing, amazing stories about Krishna, about Gopala. He is the embodiment of joy. The mother of Gopala, her name is Devaki. And she was the sister of an evil, evil king named Kampsa, who had received a prophecy that Devaki’s child would kill him. Now Kampsa, because of this prophecy, was killing all of Devaki’s children at the moment of birth. And finally he put Devaki and her husband, Vasudeva, in a dungeon, and awaited the birth of the next child, who was going to be Krishna. So to simplify the story, Devaki and her husband arranged this swap where, at the moment of birth, the baby Gopala would be swapped for her sister-in-law’s baby, who was a girl, because Kampsa was not killing the girls. So at the moment of birth, Gopala was taken away from his mother and brought across the river to his foster mother, Yasoda, and he grew up in the town of Vrindavan. And everything he did created joy and bliss for all the people around him, and the stories of his young life are so filled with happiness and the exploits of this little boy that you can’t believe it while you read them. So we sing about Gopala, but it’s an amazing two-sided coin, because on one hand the word “Gopala” just evokes happiness and joy. But then we can’t forget Devaki, who is there on the other side of the river never seeing her child grow up, and experiencing every minute this anguish, this pain. Well, all mothers will feel this, that if their child is taken away from them, it’s like this primordial despair of longing to see their child. So Gopala, the mantra Gopala— And when we say the word “mantra,” “mantra” means “that which liberates the mind,” and these words are Sanskrit words that were given to us millennia ago to transform our inner world and to connect us with the realm of pure consciousness. And this name “Gopala” evokes joy, and it evokes longing for Spirit, for the Divine Spirit, which is the longing that Krishna’s mother had, and the joy that Krishna’s foster mother had. TS: Now just one more question before we listen to this except. We’re going to listen just to a piece of this song someplace toward the middle. It seems that there’s a structure to kirtan that would be helpful to name for our listeners, where there’s a long introduction, the call-and-response, and then a conclusion. Could you explain a little bit just about the structure of a traditional kirtan? JU: Well, yes and no, because actually there isn’t a fixed structure. I know that, myself, when I’m with a group in a live setting, usually I will start something very, very slowly, and then gradually build it up, and then end it slowly again. But if you wander around India and listen to kirtan in many different places, every single temple or home or environment where people are singing kirtan will have a different sense of a structure. And it’s very personal, and that’s one of the great things about kirtan: that each person can approach it with their own set of aesthetics, their own mood, their own musical ideas, and the structure can be very different. So I have to say that, no, there is not a fixed structure. What is always maintained in kirtan is number one, the call-and-response and the repetition. Repetition, repetition, repetition. I must say, pretty much every meditative or spiritual practice from all over the world, unless I’m forgetting something, employs repetition. Because there’s something about that which just unhinges the controlling workings of the intellect. And the other thing is the mantras, the ancient mantras, that we kirtan singers experience as having so much power and richness and energy. So yes, that’s my thoughts about the structure of kirtan. I always do it a little differently. TS: Wonderful. That’s very clarifying. OK, let’s listen to a piece of “Gopala,” from Music for Yoga and Other Joys. [Music.] I love what you said, Jai, about how there’s no set structure, but it’s about really making the chants your own. And I’m curious: here you are, born in America, born to a Jewish family if I’m correct, yes? TS: And this is a pretty foreign language, and foreign gods and goddesses. And how have you made peace with all of that? JU: Well, I didn’t really have to make peace with it, because it was always very peaceful! It’s funny—in India they talk about this thing called samskaras, which I guess loosely translated means “seeds that are planted in previous lives that sprout in future lives.” Now, I don’t know for sure about any of that, but ever since I was a kid, the whole world of Indian culture and Indian arts and particularly Indian music just awakened and resonated within me and just stimulated me so much. I remember, I guess maybe when I was ten or something, seeing a picture of some nomads, maybe it was Rajasthani desert people, just a poster of them, and I was going, “Oh, my God, that’s me!” Now, I’ve never had real strong past-life recollections; I don’t even know if I ever had a past life! But probably we all did, and probably I must have had some in India. So I had started studying classical Indian music before I even went to India, I guess I was, like, 18 or 17 or something, with Ali Akbar Khan. And when I first heard the Hare Krishna singers in New York, I must have been about 15 or 16. And I wasn’t moved to join that movement, but I certainly was touched by it and really charged up by it. So it’s just a funny question—I mean, not a funny question. It’s a good question, but a funny answer: what causes us, all humans, to resonate really strongly to some things and not to resonate at all to other things? And there are a zillion theories about that, but I like the idea of the samskaras: that things from the last life blossom in this life, and that’s why we’re drawn to certain things. TS: And Jai, can you tell us a little bit about that first trip to India as a teenager, and specifically how you met your guru and what that was like for you? JU: Well, oddly enough I was going to India to see another guru, who—I won’t name the names right now—but I had thought that this other guru was my guru. And why I thought that is, whoa, that’s a whole complicated story. But I did, and I went to see him. And I found out that he was in jail for murdering many of his disciples, which was a pretty bizarre situation for me. It must have been pretty bizarre for him too! Now many, many, many, many, many years later, I don’t know if that was true or not true, whether he was guilty or not guilty—let’s put it that way. It was true that he was in prison, and there are many stories about that and many sides to that story, and I won’t even go into it. But the result was that I was suddenly there in India with no agenda, because my whole agenda had been suspended. And I was wandering around, and it was kind of strange, but I kind of felt very free because I think it was maybe the first time in my life that I had absolutely no agenda. And I was in this totally, totally foreign land that I knew nothing about; I didn’t know where to go, I didn’t know what to do. And I was just looking for clues. Now back in America, I had met and had been very impressed and very awed by Ram Dass when he came back from his first trip to India. And I had lived in a yoga ashram and Ram Dass had come over, and I really liked him and I was really drawn to basically everything that he was doing and saying, like so many people were at the time. So I went into this bookstore in New Delhi, and the shopkeeper said that Ram Dass was in town, and he told me where Ram Dass was. So I didn’t know what—I had nothing to do, so I went over to Ram Dass. Now, when I got to the hotel where Ram Dass was, they said that he had left and he had gone to this other town called Vrindavan to see his guru. Now, I wasn’t actually searching for a guru anymore, because here I was, I thought that the guru that I thought was my guru was a murderer. So I was like, “Well, so much for gurus.” I was 19 and I had already been there and done that with the world of gurus; I was very jaded. But I really liked Ram Dass and I wanted to go see him and, you know, talk to him and hang out. So I went to Vrindavan. To make a long story short, a week later I was in the temple—the Hanuman temple of Neem Karoli Baba—waiting for him to come out and give darshan, or see the people who were coming for his blessings. And the strange thing was that I was the first one there. Now me, this kid who didn’t want to have anything to do with gurus, was the first person there that morning when the doors opened. Now 40-odd years later, I don’t know why that was; I don’t remember what I was thinking or feeling that morning. But I find it kind of funny and interesting and cool that the inner motivation was stronger than the mental resistance. So anyway I was there and Maharaji [another name for Neem Karoli Baba] came out, and [sighs], well, I didn’t immediately feel that this was my guru. It wasn’t like one of those things where people say, “The light went off, and I knew he was my guru and I was devoted to him forever.” It wasn’t like that. But I was very magnetized, and you know, he was so filled with electricity and sparkling colors, and there was music going on in the temple constantly. There was 24-hour kirtan chanting of “Hare Krishna, Hare Krishna, Krishna, Krishna, Hare, Hare, Hare-Rama, Hare-Rama, Rama-Rama, Hare-Hare.” And the music was so beautiful, and Maharaji was just like this doorway into infinity. And plus, I was 19 and there was tons of free food and nobody wanted to take any money from me, because I didn’t even have any money. And so I stayed. I came every day, I came every day, I came every day. And still not thinking that he was my guru, just thinking that I wanted to go see him that day. Finally after a couple of weeks, I went there in the morning and came to the gate, which was kind of behind this statue of Hanuman, and the guy at the gate said, “You can’t come in.” And I said, “Why?” And he said, “Well, Maharaji left last night. And since he’s gone, no one can come into the back courtyard.” And I said, “Well, where did he go?” And the guy said, “He didn’t say.” And I said, “When is he going to come back?” And the guy said, “I don’t know.” And suddenly my heart was like, ohhh. My beloved had left me. And furthermore, I hadn’t even known that this was my beloved until that moment. And my heart just cracked open. And I went to sit in front of the Hanuman statue—I call it Hanuman Murti—and started singing, and I felt, maybe for the first time, I felt so much emotion in my singing, so much sadness, so much connection to not only the sadness of that moment, but to all the sadness that had been papering the walls of my inner home. And singing and singing and singing. And then some time passed, and we—meaning the Westerners—were given some clues as to when Maharaji was going to reappear and where he was going to reappear, so I went to this town where he was scheduled to come. And I was waiting a couple days, I was waiting and waiting and waiting, and I had this dream. And in the dream, I went to the train station in the middle of the night; the town was Allahabad, and I went to Allahabad Station in my dream. And I was by myself. The train came in, and Maharaji stepped off the train. And you know, he was always just wrapped in a simple wool blanket. And he stepped off the train, and he opened his arms and wrapped the blanket around me. And I put my arms around him, and he was crying and crying and crying, and I was crying and crying and crying and crying. And it was this sense of him saying to me, “Finally, finally you’ve come back to me.” And I was saying to him, “Finally I’m back with you.” And it was so deeply emotional and deeply—the feelings were so deep—and it was this sense that we had been connected and that he had been taking care of me and protecting me and guiding me for centuries and centuries, lifetimes and lifetimes and lifetimes and lifetimes, and finally I had come back this life. So I woke from my dream, and I was really kind of dazed. I remember the dream more clearly than I remember the feeling that I had when I woke from the dream. But I recall that I looked at the clock and it was something like 1:20 in the morning, you know, a.m. And after a bit I went back to sleep, and then that morning I got up and I went to the house that I had been visiting every day waiting for Maharaji to come. And everything was different at the house; the people were all quiet and walking around like, walking on eggshells kind of. And I said, “What’s up? What happened?” And they said, “Well, Maharaji arrived last night by himself at the Allahabad train station at 1:20 in the morning, and he’s alone in his room now.” And, you know, I was . . . well, the dream had really revealed to me that he was my guru. But I know my own mind, and that probably after a couple days, I would have started doubting the dream: “Oh, it was just a dream,” you know? But the fact that then this earth reality put a stamp of reality on, like, cosmic reality, on the dream, it felt like, “Well, OK.” From that day on, Maharaji was my guru. But to this day, again—when was that, that was 1971 I guess? So that’s 39 years or 40 years? It’s a long time ago. I still don’t exactly know what is meant by a guru-disciple relationship. What is a guru? Who is a guru? I think the reality of that is beyond our minds, although we can speculate and talk and write and discuss for a million lifetimes. But it’s bigger than that, and all I know is that the trip to India when I was 19—and I was there for four months, and out of the four months, probably two months were actually in the physical presence of Neem Karoli Baba. Since then, my life has been revolving around—I’m a planet revolving around his sun. Now, has that spared me from going through the waves and ups and downs of human karmic existence? No, not at all. But maybe, maybe I could say he saved my life ten thousand zillion times, and I feel so much grace and so many blessings in my life now. And I attribute it to him, because I kind of know myself: I know that left to my own devices, I’m not such a spiritually directed person, I’m more selfish and lazy and self-destructive. But I don’t know—Maharaji’s being and his spirit so many years after he’s not even in his body are so central to my life now. It’s kind of unbelievable! TS: Well, it’s a very powerful metaphor that you’ve offered: the idea of a planet revolving around the sun Maharaji, your guru being the sun. How does that actually play out in your life? What does that mean? JU: For one thing, if you come to our home, you’ll see pictures of him all over the place looking at us, just kind of benevolently guiding the steps that we take. As a day-to-day spiritual practice, I do a couple of things regularly, a couple of little rituals—little offerings and chants, kirtans—that I do every day without fail. But they’re very short. It’s not like I’m a big disciplined guy that sits for hours doing spiritual practices. I’m not that. But I offer to my guru my actions and the fruits of my actions on a daily basis. Now, as soon as my little ritual of offering is finished, I forget and I take it all back. But I trust and I hope and I pray that he’s guiding each of—guiding my footsteps. And then I go and I sing with groups, and I’m sitting there in front of my microphone and in front of my instrument, and I’m thinking about this and that. I’m thinking about where am I going to sleep, and how am I going to get a good night’s sleep, and when am I going to get home? I’m not spiritual; I don’t have these spiritual, divine thoughts. And but for a moment, I pray, I say, “Maharaji, I’m here for a reason, and all these people are here for a reason. Please guide my voice. Please guide my heart. Please guide my melodies. Please guide my words and take over this event.” And then I go into it. And every time we eat, we say a moment of prayer—and when I say moment, it’s like really fast. But I say, “Maharaji, take this food, take this food and turn it into something that will sustain my spirit, as well as my body.” And then we eat. And, I say these things inside; I don’t say them outside. I’m not sure what my wife is saying, and I’m not sure what my little boy is saying. But it’s like Maharaji is living in our home with us. TS: Now, Jai, I’m willing to accept your first-person report just as it is; I mean, just on face value. And at the same time, a question emerges, and I’m just curious how you would respond to it. Which is, is Maharaji a symbol for you—not necessarily an external force that’s actually guiding and helping you—but simply a symbol that brings out this higher nature in you? JU: Well, I’ll tell you what I feel about that. Again it goes back to what I said before, where I think what and who the guru is, is beyond our real, real understanding. I feel like guru, like there’s such a thing as the guru principle and it’s this aspect of the infinite divinity, which manifests to guide us. And I feel like some people–I feel like every person has a guru. But only for some people, the guru takes a human form. And what that is, it’s not because those people are special—I don’t know. It’s just because those people need that. So to me, the guru took form as Maharaji. Now I feel Maharaji as very present and that he’s not a symbol; that’s he’s an actual being that might not have solid physical form, but is form nonetheless. And not just an abstract symbol or just like an imaginary symbol. I feel like he’s really real. And I think most, if not all, of the people who were with Maharaji—Indians and Westerners—back in the sixties, and some in the fifties, sixties, and early seventies, also have this experience: that his presence is very tangible. So I think he’s real and not just a symbol. But I also feel like it doesn’t matter what I think exactly; that the presence of that being who is the guru is just constant. And our awareness of that presence is of course not constant, because we’re human beings. But the presence itself is constant. TS: Thank you. I’d love to play now one of my favorite songs from the Sounds True catalog of Jai Uttal—we have five different records, actually, that we’ve released. And one of them is a double-CD set on kirtan. And the very first song is a song I’ve listened to over and over again; it’s called “Ganesha Sharanam.” And maybe you can just briefly introduce it, and then we’ll listen to it together. JU: OK, sure. Well, Ganesha is the elephant-headed god from India who’s very, very popular in the West and all the yoga studios and yogic traditions. Ganesha is the one who is said to clear the obstacles from our path. And he’s a very jolly god, and he’s loved by all the kids. And “Ganesha Sharanam” says simply, “I take refuge in Ganesha, the Great Elephant.” He’s the son of Lord Shiva. And when we were recording this—you know, when I’m recording all these records, I have a vague plan in my mind, but a lot of it is really stream of consciousness; like, whatever ideas come up, we’ll try them out. And this is one of the great things about having a studio at home. So Ben and I were recording that day in my home studio, and our friend—a woman named Lisa Maria—comes over with daughter, Sirocco. And we said, “Hey, Sirocco, you want to try to sing this?” And she said sure, and she said, “How much are you going to pay me?” And I said, “Well, I don’t know. I could pay you 10 dollars.” And she said, “OK, I’ll do it.” She was a little girl at that point, and she sat down and we recorded her, and she sang. And you know, I thought it was really fun and really cute. What I didn’t expect is just how many, many, many, many people have totally responded to hearing that Indian kirtan with a kid singing. And I love that fact, that this has touched so many people’s hearts and so many kids, too. TS: I do love that song, Jai. JU: I love it, too. TS: I’m curious about something: we have now mentioned several different Hindu gods and goddesses, just in our short conversation here. You know, we’ve talked about Krishna, Ganesha, and you mentioned how you were sitting in front of a Hanuman statue. And so how do you personally make sense of all these different Hindu figures? JU: In some ways, it doesn’t make sense at all. To anyone in our Western-world upbringing, there’s not a lot of sense in it. How can we have loose-skinned, 16-armed gods and goddesses? It’s just kind of crazy. But in all my traveling and wandering, and both physically traveling and also kind of internally traveling, there have been different times when all of these beings have felt very, very, very real to me. And then other times where they feel more archetypal or mythological, or just educational, I guess you could say. And so I notice in myself that my mental understanding and mental explanation of this whole Vedic tradition seems to change. And yet, what the contemplation of these deities does to my inner being doesn’t change; it always seems to resonate and awaken and create movement and create transformation within me. So there’s so much more than meets our eye. I’ve come to the place where I totally, totally, totally accept a four-armed, blue-skinned god named Vishnu resting in the couch-like body of a 1000-headed serpent named Sesha, who is floating in an infinite ocean of milk. And meanwhile, the goddess Lakshmi, the eternal beloved of Vishnu, is giving him a foot massage. And out of Vishnu’s belly, out of his navel, is floating this lotus, and inside the petals of the lotus is the four-faced creator god, Brahma. I accept that as a reality. TS: What do you mean by that, you “accept it as a reality”? What do you mean by that? JU: That the existence of these beings is as real as the existence of myself. JU: [Laughs.] But I don’t necessarily think about it all that much. It’s like, I sing to Krishna— Well, I’ll put it this way: one of the great, great, great epics of India is the Ramayana. Well, the Ramayana is the story of Rama, who is God in human form, and his beloved Sita, who is Goddess in human form. And they’re wandering through the jungle, through the forest having the adventure of their life: the abduction of Sita by the demon-king Ravana, and her eventual salvation by Rama and his best beloved friend and devotee, Hanuman, the monkey god, who is actually Shiva. So I read this story and heard this story so, so many times since I was a teenager. And I remember there was one time—it was probably about 20 years ago, 25 years ago maybe—I was reading this story again and feeling what an amazing, amazing metaphor the whole story is for the internal spiritual journey. And I was studying it in that light, and I was reading some books that were essays about the Ramayana from that point of view. And thinking the whole system was based on archetypes and how each character of the Ramayana was an archetype, and so much could be learned, and so much inspiration could be gained from it. But of course I wasn’t thinking that it had actually happened—you know what I mean. So I went to India then shortly after that, it was one of my trips, and I was at my guru’s ashram in South India. Now, this was after my guru had died. And there is a woman, a very, very elderly, very, very spiritual, very, very wonderful, wonderful woman who is taking care of Maharaji’s temples. So she said to me, “Hey, Jai”—you know, she spoke in Hindi—but she said, “Jai, let’s go visit Rameshwaram.” And not just me, a bunch of people. And she took us on this little pilgrimage to this town called Rameshwaram, which was one of the key places in the story of the Ramayana. And we got there—and it was an overnight journey, it was really amazing, it was really fun, it was a really cool adventure. And first thing she does is she takes me to a palace, an old, old rundown, broken-up palace, and she says, “This is one of the places—” Well, she points this palace out as one of the places where a lot of the Ramayana had taken place. And I instantly got this kind of trembling energy, like, wow, this was where—it was physical! And then for the rest of the day, she took us to all these other places where different events of the Ramayana had occurred. And by the end of the day, this story that I had felt was an archetypal story, was a myth, was a teaching myth, was a devotional, romantic tale, had become absolutely real to me, because each of these places was so filled with energy and with power and with the literal remembrance of different episodes of the story. So since that time, I haven’t thought about it in the same way at all. I’ve thought about it totally as a history that occurred in a time when life on earth was quite different than it is now. Now, am I nuts? Maybe. But there’s quite a big, big, big, big tradition behind me saying no, I’m not nuts, that this did actually happen. And that what we think we know about the history of human beings on this planet is only a very small, small, small glimmer of what the reality actually is. So I don’t know, Tami. Since that day, my understandings and my appreciation of all these crazy stories of Hinduism have changed. And at the same time, when I tell people the stories and I kind of relate some of the background behind the kirtans and behind the chants, I always say, and I really believe, that it doesn’t matter on which level one appreciates these stories. Because if you take it as mythology, if you take it as archetypes, if you take it as metaphor, or if you take it as absolute reality, that’s all mental. But what happens emotionally, internally, on the soul level, happens regardless of what we believe mentally. So the words that we sing in kirtan, the effect of them, is so strong and so powerful, and it really matters very little whether one takes it as—like singing to Krishna, for example—takes it as just an energy, or as a symbol, or as an actual physical being. It really doesn’t matter. I don’t care what another person feels when they’re singing it. I mean, I care in that—well, let me reword that: I care what they feel, but I don’t care what they think! [Laughs.] Because I trust so much that this practice and that these mantras and that these stories—because the stories are like mantras, as well—have a great, great, great transformative effect on me and on everyone who invests in them. TS: What do you mean, Jai, “the stories are like mantras”? JU: Well, a mantra is a word that transforms the mind, that liberates the mind. The stories of these gods and goddesses are stories that transform the mind. Now, I don’t necessarily expect anyone to believe me when I say that, so I’m only speaking from my experience, from my own belief, my own what’s happened to me, and what continues to happen to me when I hear or tell these stories. Particularly if I hear them from someone who’s inspired, which makes sense anyway, I feel that the stories awaken different places in me every time I hear them or every time I tell them. You know, it’s just like the Baal Shem Tov in the Kabbalistic Jewish tradition—they tell stories over and over again, because the stories themselves elicit responses like spiritual expansions and transformations inside the listener. So that’s what I mean by the stories being a mantra: it’s not literally so; the stories are not a mantra. But they carry the same energy as mantras insofar as they carry the energy of these deities. JU: Well, Rama or Ram is one of the great names in the kirtan tradition. Rama—you know, all these names we could very loosely say, “OK, it just means God. They’re all different names of God.” And that is true; I think maybe that’s the widest, most true translation of any of them. But Rama is also the name of this particular aspect of God who manifested as a human being, a king, in the Ramayana. But my guru, Maharaji, he would say, “Ram, Ram, Ram,” all the time; he would say it under his breath. He would count japa, [japa is a spiritual discipline involving the meditative repetition of a mantra or name of God] on his fingers. And he would always say that with the name of Ram, or the name of Rama, “The impossible becomes possible. Everything is possible if you repeat that mantra ‘Ram.’” So I love to say that word: “Ram” or “Rama”—it’s the same thing. And it has been so important a word in my life since I met Maharaji in 1971. JU: [Chuckles.] You know, I struggled my whole life and I still continue to struggle with the voices inside of myself that say, “Jai, you shouldn’t sing. Your voice isn’t good. You’re not a natural singer. You’re good at playing an instrument, but don’t sing. Your voice is horrible. Besides, what do you have to offer? You’re not spiritual, you’re not even very nice,” all this stuff. You know, like so many of us, I have those incredible voices of self-criticism and self-loathing, which sounds so extreme, but it’s a rampant disease. Didn’t the Dalai Lama say that the one difference between our culture and his culture is that people in the West don’t like themselves? So I decided one day—I don’t know if it was really one day, you know?—but I decided OK, if it’s sing or die, I’d rather sing. My soul wants to sing, because that’s how I feel whole and free. So I started singing. Now the voices of criticism, self-criticism, they haven’t gone away, Tami. This is many, many years later, and they’re still quite there. But they don’t have such a strong hold on me, and when they start screaming at me, I just say, “Hey, guys, thanks for sharing, and I’m going to keep singing, and if you don’t like it, well, you’ll have to suffer through it.” I’m saying that to myself, you know? And then usually they walk off and try to find another theater to attend. But this is what I share with people, I say, “We gotta sing, it’s part of our–.” You know, other cultures, people sing all the time. In India, people sing all the time. In Brazil, even. My wife, Nubia, she sings all the time; she knows ten zillion songs and she always sings them. Why do we in North America—and Europe, too, I would say—why are we so constricted around this beautiful human expression? Well, I just encourage people to move forward into it, even with those voices, and even with those fears, and even with that shyness, and even with that ridiculous belief that we shouldn’t sing. And the other thing I do is, which is more for myself, these days I’m not as nervous and shy and filled with stage fright as I used to be. But sometimes it comes up stronger than other times—I don’t exactly know why. But what I do is, I just talk about it to the audience. I don’t go into a full-on therapy group, but I mention it. I try to be real with people, because I find that when I’m honest and not hiding, then the powerful hold that these feelings have upon me becomes less powerful. And then I can just sing. And I used to think, “Oh, people want to only see the strong, powerful Jai singing, full of strength and power”—whatever, you know? And later I realize, no, people want to see humanness. We all want to see humanness in each other, because that’s what we love, you know? We’re humans and we generally don’t love the humanness in ourselves, but when we see it in others, that is what we love. So I just try to be honest about it and not hide it at the times when I really am scared. And it seems to help others too, which is really cool. But the motivation at first is to help free myself from these terribly inhibiting inner ogres. TS: Well, I love it. And, Jai, you’ve been so honest, human, and transparent in our conversation today. I really appreciate it. And what I’d say to all of our Sounds True listeners is: start singing, keep on singing, sing, sing, sing! These five CDs that we have from Jai are fabulous to sing with; I love to sing with them, usually in the car by myself, but still at quite a high volume. TS: We’ve heard today from a new release from Jai Uttal and Ben Leinbach, Bhakti Bazaar. And also from a previous release, Music for Yoga and Other Joys. Jai has also created a double-CD set on the art and practice of kirtan, as well as two other releases from Sounds True: one called Dial M for Mantra, which is a remix of Jai Uttal songs by Rara Avis and Shaman’s Dream; and also a release called Loveland: Music for Dreaming and Awakening. Jai, thanks so much for being with us here on “Insights at the Edge.” Thank you! JU: Thank you, Tami. And also thank you for creating such a great, supportive, and beautiful record company, Sounds True. TS: Fabulous. Our pleasure. SoundsTrue.com: many voices, one journey.